Fulham manager Mark Hughes has resigned after less than a year in charge at Craven Cottage. Hughes has been linked with the vacant job at Aston Villa, but it looks increasingly unlikely the Midlands club will move to appoint the Welshman. The 47-year-old Hughes also denied that he had been approached by another club before he chose to quit at Fulham. "As a young, ambitious manager I wish to move on to further my experiences," he said. "I believe my management team and I have done a good job and the club has a strong foundation from which they can go forward. "I would also like to take this opportunity to clarify that neither myself nor my representative have approached or have been approached by another club. The dust has not yet settled on where Hughes' next destination might be, but it is clear the Welshman believes he is on the way to bigger and better things. "This decision to leave Fulham has not been influenced by any outside party." 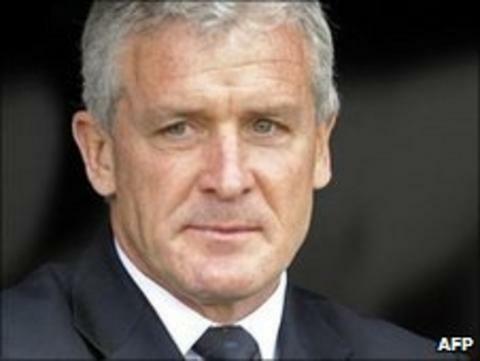 Hughes was strongly linked with Villa once they confirmed the departure of former manager Gerard Houllier on Wednesday. But Friday's newspapers suggest Villa will not be making contact with Hughes, while BBC Radio 5 live's Midlands football reporter Pat Murphy says Villa have been put off by the manner of Hughes' exit from Fulham. "I don't believe Mark Hughes will be the new Villa manager, no," said Murphy. "The events of the last couple of days haven't done much for Hughes and Villa chairman Randy Lerner likes things to be done a certain way. "Chief executives talk to chief executives in this game and it's possible Fulham have marked Aston Villa's card. "Hughes clearly feels he has bigger fish to fry, he's used to dealing on the big stage and his exit at Man City still rankles, but I don't believe he is eyeing up Villa as his next job. "Villa have got a number one target, but they won't tell me who that is. I think Steve McClaren would be a good shout and Carlo Ancelotti would be a very good signing." Fulham had been in talks with Hughes to extend the two-year deal he signed in July, but the club admitted defeat in their attempts to prevent him walking away after he offered his resignation. The Cottagers hope to have a manager in place in the next three weeks, in time for the start of their Europa League campaign, with the likes of former Spurs boss Martin Jol, ex-Charlton and West Ham manager Alan Curbishley and former Villa boss Martin O'Neill linked with the vacancy. Hughes will serve a month's notice and be available to another club from the end of June - but BBC Sport understands that Premier League rules mean neither he nor his agent can be contacted by other clubs until after 30 June. The former Manchester City manager, whose final game in charge of the club was a 2-2 draw with Arsenal, had brought stability to Fulham in the wake of predecessor Roy Hodgson's departure to Liverpool last summer. Deprived of the services of striker Bobby Zamora for much of the season, Hughes steered the club to an eighth-place finish with 49 points - four places and three points better than they achieved in their previous campaign. Fulham also qualified for Europe through the Premier League's fairplay standings and defender Philippe Senderos admits he is stunned by Hughes' departure. "I didn't see it coming, no-one did," said the Switzerland international. "It's sad for everyone because we have had a good campaign and we were hoping to build on that next season but we will see what happens. "It's something that happens in football. The sooner Fulham are able to get a manager, the better." Hughes' first foray into management was with Wales who he took to within one game of qualifying for Euro 2004. He subsequently took over at Blackburn and, after avoiding relegation in his first season, managed three successive top-10 finishes to attract the attention of Manchester City in June 2008. After the Abu Dhabi Group's takeover of the Eastlands club three months later, Hughes oversaw a spending spree that included the recruitment of Brazilian playmaker Robinho for £32.4m, a British record at the time. The likes of Emmanuel Adebayor, Joleon Lescott and Carlos Tevez followed, but Hughes' results failed to match the owners' expectations and he was fired in December 2009 with City sixth in the Premier League.